The Wrecking Crew was a moniker coined by famous studio drummer, Hal Blaine. It was a nickname for an incredible group of musicians who played anonymously on hundreds of huge hits in the ’60s and ’70s as well as countless TV show themes and commercials. These studio musicians wrote the arrangements and played on some of the most successful recordings in all of popular music history. These musicians, some of whom would become huge artists in their own right, like Glen Campbell, Leon Russell and Dr. John…were hired hands who recorded songs everyday, punching the clock so to speak, not knowing these songs would be hits, and ended up being the “back up band” on huge recordings by the Beach Boys, Paul Revere and the Raiders, The Carpenters, Simon and Garfunkel, The Mamas and Papas, The Monkees, Elvis, Frank Sinatra, The Righteous Brothers, Jan and Dean, Neil Diamond and hundreds more. Most people did not know their story until a film about their musical journey entitled The Wrecking Crew was produced and released in 2015 – it is now available on Netflix and DVD. 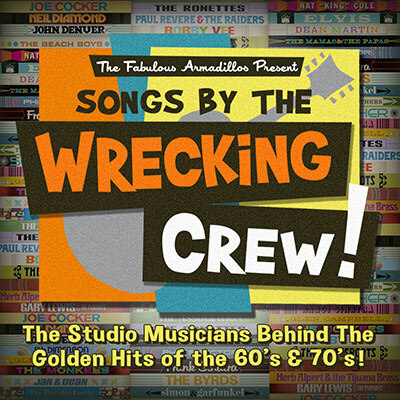 The Fabulous Armadillos will be showcasing some of the Wrecking Crew’s best known songs and TV themes in this fun look back at a much simpler time.